Click on cover for more info or to order. In the summer of 1985, thirteen-year-old Ben Brendel, still grieving the loss of his best friend, forms an unlikely friendship with the seventeen-year-old girl across the street. Aubrey Rose shares his love for film and soon helps him rekindle his passion for filmmaking. But shortly after their first film is sent to the developing lab, Ben finds himself haunted by bizarre visions and nightmares. And when he brings the film home, nothing can prepare him for the dark secret it will reveal, bending the fragile bonds of family and friendship past the breaking point, and testing the courage and strength of a boy on the cusp of manhood. WHEN WE FALL is a dark coming-of-age tale you won't soon forget. 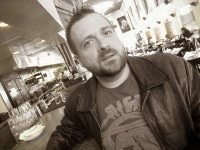 An active member of the International Thriller Writers and the Horror Writers Association, Peter Giglio is the author of five novels, four novellas, and his works of short fiction can be found in a number of notable volumes, including two comprehensive genre anthologies edited by New York Times Bestselling author John Skipp. Peter resides on the Georgia coast with his wife and frequent collaborator, Shannon Giglio.